Day Stage (Acoustic) : RM 370 - Performance, Priority entry, Photo Session, stand a chance to win Tea Time with Lunafly. Night Stage (Live Performance) : RM 370 - Performance, Priority Entry, Autograph Session, stand a chance to win Tea Time with Lunafly. Day Stage (Acoustic) : RM 270 - Performance, Lunafly Autographed Poster, stand a chance to win Tea Time with Lunafly. 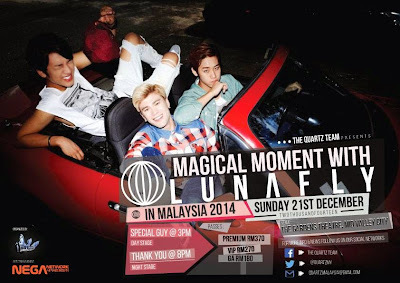 Night Stage (Live Performance) : RM 270 - Performance, Lunafly Autographed Poster, stand a chance to win Tea Time with Lunafly. We will only accept bank-in transfer (for Malaysians only) and Paypal (for international fans) with 4.44% fees. That's not it as more advantages are provided if you purchase the Premium passes as there will be another private event that you can enter (by purchasing) ONLY for the first 15 fans that purchased the Premium Passes. We will announce the event detail soon! Also we will give away Lunafly's Autographed Special Guy Album for the first few fans that purchased the Premium Passes! We will reply your email within 48hours! For more information and further inquiries, head on to The Quartz Team Facebook page!